SOUTH BEND, Ind. 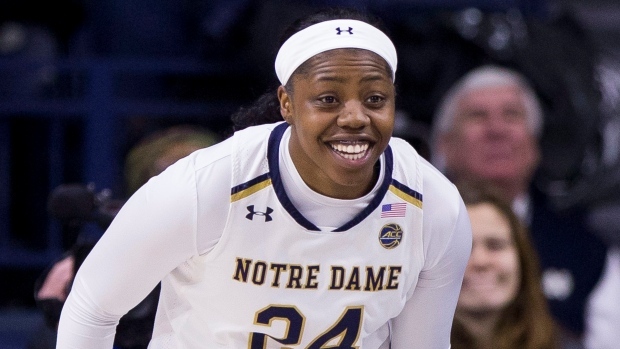 -- Arike Ogunbowale scored 23 points and teammate Jessica Shepard had a double-double as No. 3 Notre Dame, the No. 1 seed in the Chicago Region, began defence of its NCAA championship with a 92-50 victory over No. 16-seed Bethune-Cookman on Saturday. Ogunbowale hit 8-of-15 shots while adding four assists and three steals for the Fighting Irish (31-3), who never trailed. Notre Dame shot 54.5 per cent (36 of 66) with 24 assists. Bethune-Cookman: The Lady Wildcats never led but were down just 9-7 with 5:36 left in the first quarter when they went cold. They went 8:59 between baskets in the first half before Golden drained her third 3-pointer with 2:49 to play in the first half to finish with a 7-4 run. Bethune-Cookman shot just 16.7 per cent (3 of 18) in the second quarter. Notre Dame plays Central Michigan-Michigan State winner in second round Monday.